This S-mount lens is a great value for equipment manufacturers. The lens has a fixed iris. It is focused by threading it in or out of the mount, then locking it in place with the included nut. 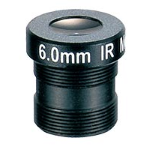 This lens includes an integrated IR-cut filter for improved performance when imaging visible light. PLEASE CONTACT US FOR A DISCOUNT IF PURCHASING 10 OR MORE.